1. Preheat the oven to 180°C, gas mark 4. Start by making the cranberry filling. Stir the cranberries, caster sugar and crème de cassis over a medium heat until thick and jam-like. Add the vanilla extract and set aside to cool. 2. Meanwhile, break the chocolate into pieces and melt gently in a large bowl over a pan of simmering water. Set aside to cool. 3. Line the base of a 25cm loose-bottomed cake tin with greaseproof paper. Beat the butter and sugar together until light and creamy, then beat in the remaining ingredients. Fold in the cooled melted chocolate. Tip half the batter into the tin, then top with the cranberry mixture, spreading it evenly and leaving a 3cm border. Top with the remaining batter and bake for 35-40 minutes until set. Leave to cool in the tin. 4. Serve warm or at room temperature. 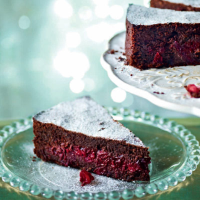 Remove the cake from the tin, dust with icing sugar and serve with double cream or vanilla ice cream, if liked.